We are sticking with our new publication format from last year, a combination of the former event program and info guide. A handy digest size reference guide (7×10) that will be a single source for convention information, providing schedules, guest information, including campus maps and facility diagrams. It will contain all the needed information for our attendees to stay up-to-date on all SUN ‘n FUN activities. Here is a link to an online version of the 2018 In-Flight Guide for your review. The Expo Map will be inserted into the In-Flight Guide to complete the info package. The In-Flight Guide will be printed on glossy light-weight paper. Print ad sizes for both the In-Flight Guide and Expo Map have been standardized to simplify ad placement and help you take advantage of bundle discounts. Advertisements enjoy high exposure frequency, given the rich value of this reference guide. 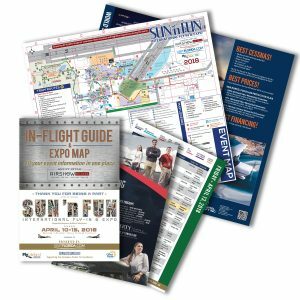 Click here to download the 2019 SUN ‘n FUN Advertising Packet that contains the SUN ‘n FUN In-Flight Guide contract and mechanical requirements.